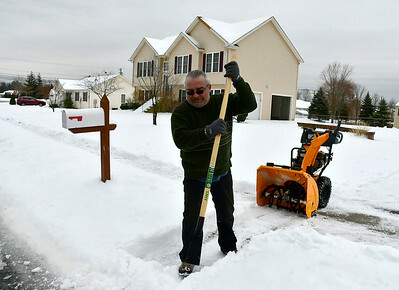 1/23/2019 Mike Orazzi | Staff Svet Vassilev clears ice and snow from a sidewalk along Sunnydale Avenue in Bristol Wednesday. 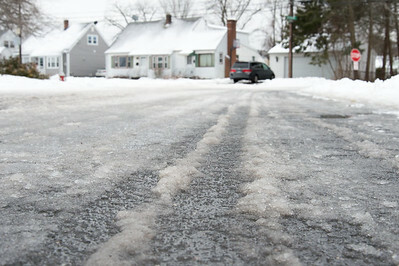 01/23/19 Wesley Bunnell | Staff Several streets and sidewalks still remain covered in snow and ice on Wednesday after a weekend storm. 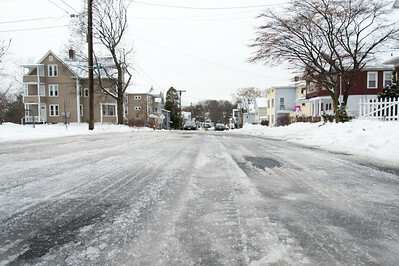 A look down Highview Ave towards the intersection with Pierremount Ave.
01/23/19 Wesley Bunnell | Staff Several streets and sidewalks still remain covered in snow and ice on Wednesday after a weekend storm. 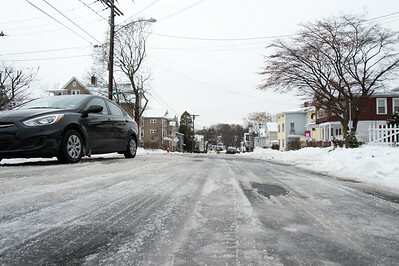 A look down Austin St.
01/23/19 Wesley Bunnell | Staff Several streets and sidewalks still remain covered in snow and ice on Wednesday after a weekend storm. 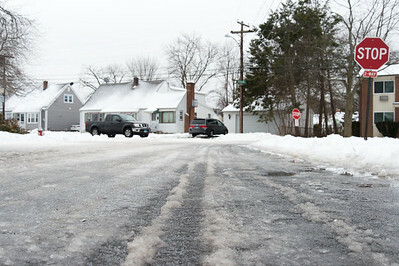 A look down Austin St. towards East St.
01/23/19 Wesley Bunnell | Staff Several streets and sidewalks still remain covered in snow and ice on Wednesday after a weekend storm. 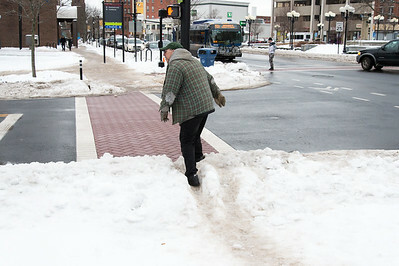 A pedestrian makes her way down a snowy sidewalk near Main St and Court St as a private contractor helps clear the area outside of TD Bank. 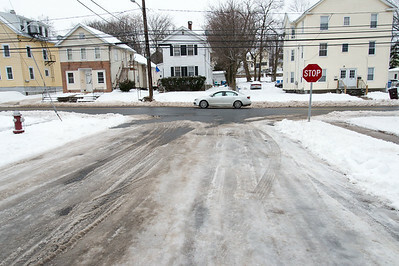 01/23/19 Wesley Bunnell | Staff Several streets and sidewalks still remain covered in snow and ice on Wednesday after a weekend storm. 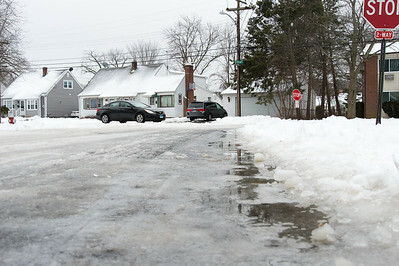 A portion of sidewalk buried under snow on Main St and Central Park. 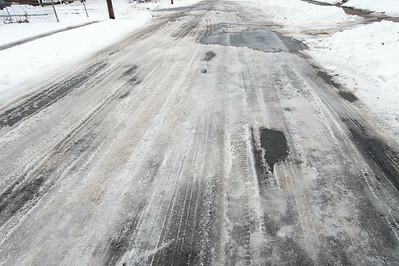 01/23/19 Wesley Bunnell | Staff Several streets and sidewalks still remain covered in snow and ice on Wednesday after a weekend storm. 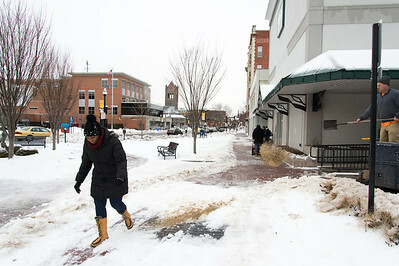 Pedestrians make their way down an uncleared sidewalk on Main St near the intersection with Bank St.
01/23/19 Wesley Bunnell | Staff Several streets and sidewalks still remain covered in snow and ice on Wednesday after a weekend storm. 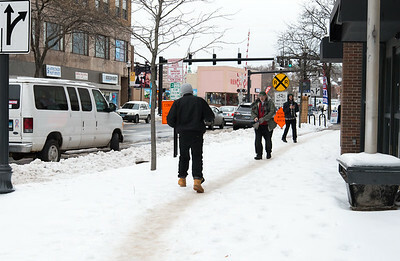 A pedestrian climbs over a mound of snow at an uncleared section of sidewalk at the intersection of Main St and Bank St.
01/23/19 Wesley Bunnell | Staff CCSU held a conference on Wednesday afternoon moderated by President Zulma Toro to discuss and answer questions regarding the personnel and organizational changes taking place following a nine month investigation into allegations of sexual misconduct by CCSU theater professors. 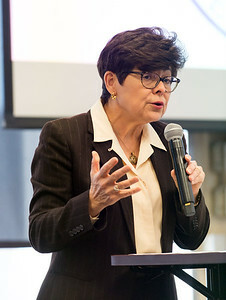 Dr. Zulma Toro speaks to the attendees. 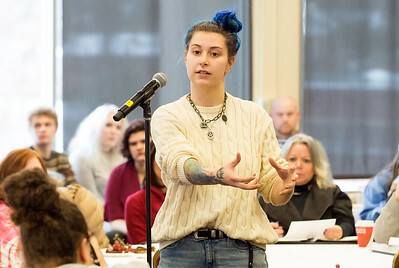 01/23/19 Wesley Bunnell | Staff CCSU held a conference on Wednesday afternoon moderated by President Zulma Toro to discuss and answer questions regarding the personnel and organizational changes taking place following a nine month investigation into allegations of sexual misconduct by CCSU theater professors. 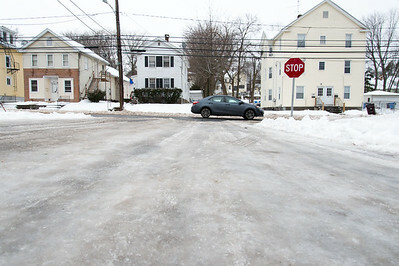 Senior student Erin Sagnelli asks questions regarding the changes. 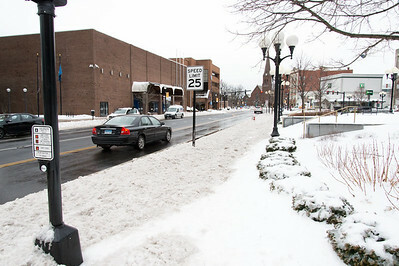 01/23/19 Wesley Bunnell | Staff CCSU held a conference on Wednesday afternoon moderated by President Zulma Toro to discuss and answer questions regarding the personnel and organizational changes taking place following a nine month investigation into allegations of sexual misconduct by CCSU theater professors. 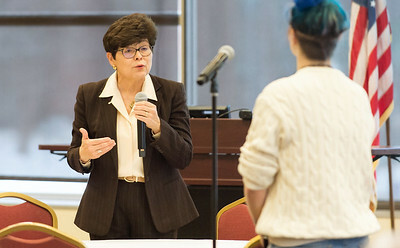 President Zulma Toro responds to questions from CCSU Senior Erin Sagnelli. 01/23/19 Wesley Bunnell | Staff CCSU held a conference on Wednesday afternoon moderated by President Zulma Toro to discuss and answer questions regarding the personnel and organizational changes taking place following a nine month investigation into allegations of sexual misconduct by CCSU theater professors. 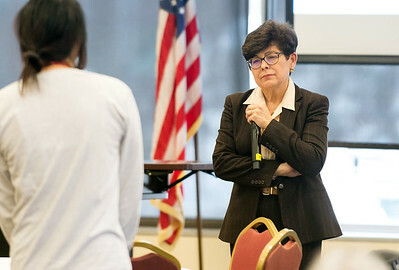 President Zulma Toro listens to questions from a CCSU student. 01/23/19 Wesley Bunnell | Staff CCSU held a conference on Wednesday afternoon moderated by President Zulma Toro to discuss and answer questions regarding the personnel and organizational changes taking place following a nine month investigation into allegations of sexual misconduct by CCSU theater professors. 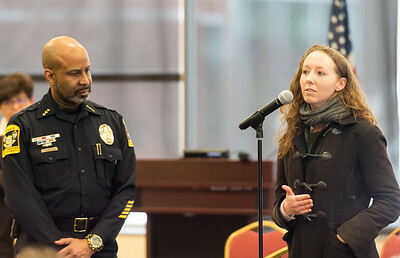 CCSU Police Chief Gregory B. Sneed, L, and Diversity Associate Sarah Dodd. 01/23/19 Wesley Bunnell | Staff CCSU held a conference on Wednesday afternoon moderated by President Zulma Toro to discuss and answer questions regarding the personnel and organizational changes taking place following a nine month investigation into allegations of sexual misconduct by CCSU theater professors. 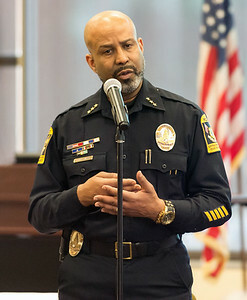 CCSU Police Chief Gregory B. Sneed. 01/23/19 Wesley Bunnell | Staff Plainville wrestling defeated Berlin at home on Wednesday night. 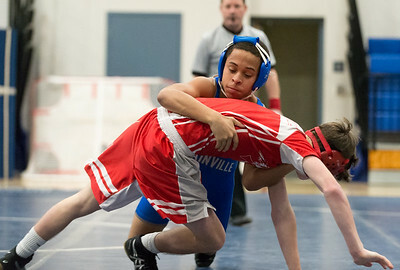 Berlin's Noah Cintron vs Plainville's Johnny Guzzardii in the 106 lb match. 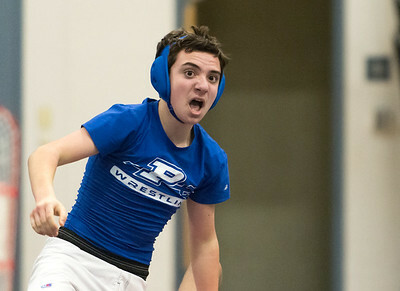 01/23/19 Wesley Bunnell | Staff Plainville wrestling defeated Berlin at home on Wednesday night. Plainvllle's Dylan Bucci vs Berlin's Shan Naeem in the 113lb match. 01/23/19 Wesley Bunnell | Staff Plainville wrestling defeated Berlin at home on Wednesday night. Plainvllle's Dylan Bucci after his victory. 01/23/19 Wesley Bunnell | Staff Plainville wrestling defeated Berlin at home on Wednesday night. Plainville's Jayden Barton vs Berlin's Jake Kaplan in the 120lb match. 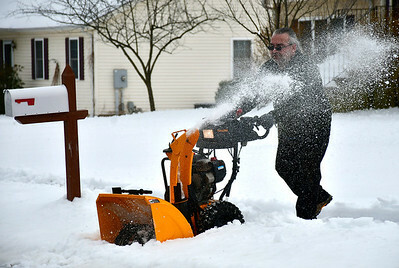 01/23/19 Wesley Bunnell | Staff Plainville wrestling defeated Berlin at home on Wednesday night. Plainville's Dom Pedrolini vs Nat Orde in the 126lb match.